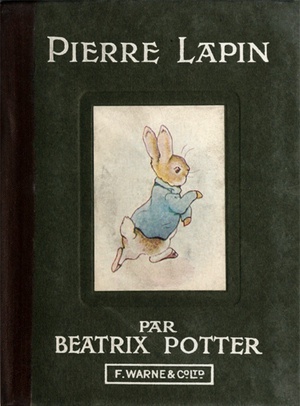 In 1916, when Beatrix Potter was 50 years old and her creation Peter Rabbit was a teenager, the following version of Potter’s classic was released in the United States by The Saalfield Publishing Company. Not by Potter’s publishers Frederick Warne & Co and not with Potter’s own illustrations. Well that last bit is not entirely true as I discovered while browsing through this e-book from Project Gutenberg. Here’s the original. The part where it says “illustrations by Virginia Albert” is mostly true. Compare these images from both books. Yes. 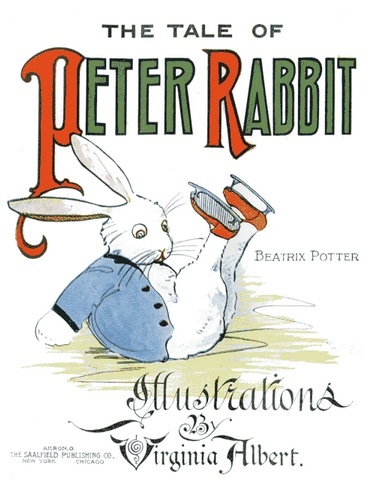 There they are – copies of Potter’s work tucked in among the ‘new’ version of the illustrated bunny and looking a little strange in the company of the very different approach of Virginia Albert. Warne & Co must have had their copyright all stitched up in Europe as this French version [all rights reserved] was printed in Great Britain. 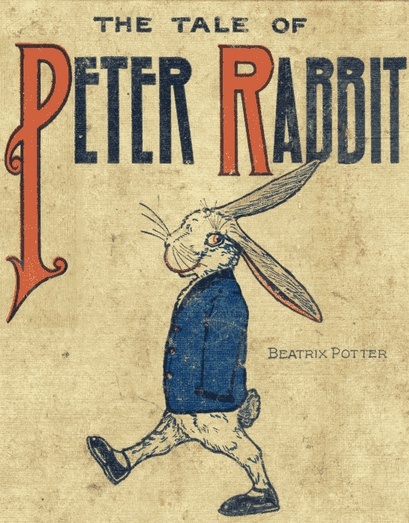 Apparently Warne’s New York office did not register the copyright for The Tale of Peter Rabbit in the US thus opening the floodgates to imitators and blocking the considerable income stream that Warne and Potter herself would have earned. 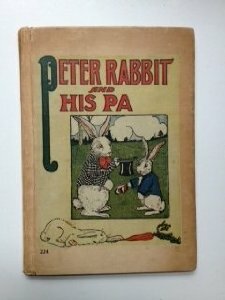 At Abe Books (online sellers of used books) you can find pirated editions of Peter Rabbit that were published as early as 1904 when, for example, the Philadelphia publishers Altemus copyrighted The Tale of Peter Rabbit using all of Potter’s illustrations and text. They left one thing off – the author’s name! I note too that the Saalfield Peter Rabbit books were all copyrighted. 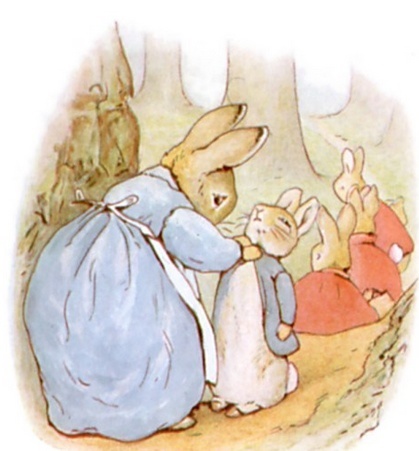 Virginia Albert went on to illustrate other Peter Rabbit books also published by Saalfield. One can only imagine the response of Beatrix Potter to the titles and content. By Louise A Field with Albert’s illustrations there was Peter Rabbit and his Ma, then Peter Rabbit and his Pa. By an unknown author with Albert’s illustrations came Peter Rabbit and Sammy Squirrel and Peter Rabbit and Jimmy Chipmunk. The style of the illustrations is inconsistent. These images are via Amazon. 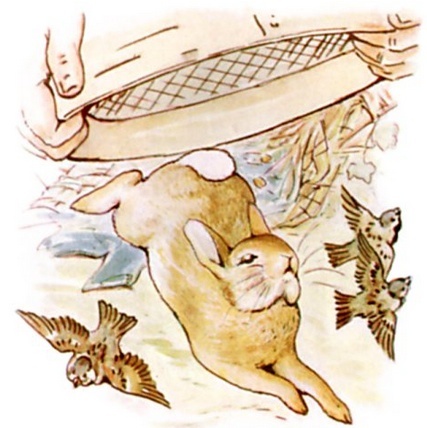 To add to the fun, another illustrator by the name of Ethel Hays put her oar into the Peter Rabbit waters. Ethel Hays was the illustrator of the Raggedy Ann stories. Images via Wikipedia and Amazon. 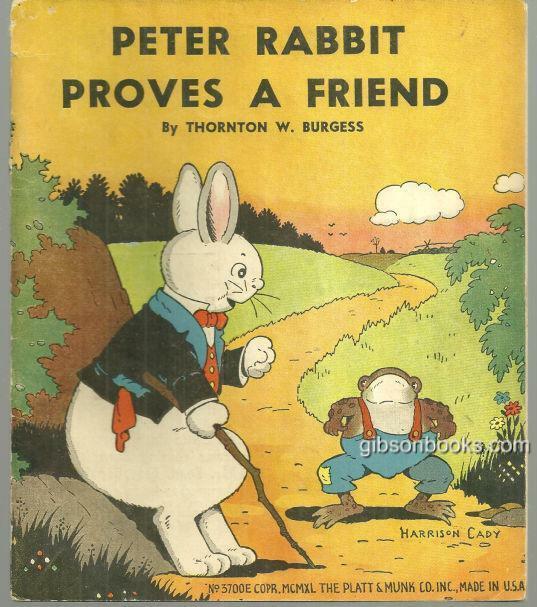 American children’s author and conservationist Thornton W Burgess wrote many stories based on Peter Rabbit. They included Mrs Peter Rabbit, Peter Rabbit Puts on Airs and Peter Rabbit Learns from the Striped Chipmunk. 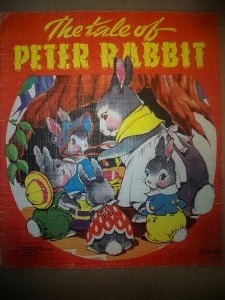 The Peter Cottontail character morphed out of these tales. (Remember that Cottontail was one of Peter Rabbit’s brothers in the original tale). 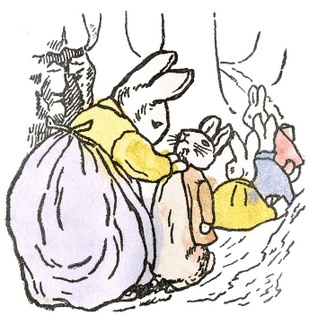 Harrison Cady who illustrated many books for Burgess, including Peter Rabbit Proves a Friend, wrote and illustrated a newspaper comic strip called Peter Rabbit from 1920 to 1948. Image via e-Bay per Gibson Books. And so it goes. 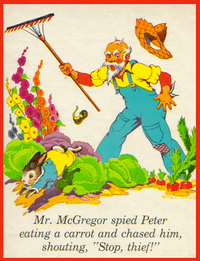 Mr McGregor protected his vegetable patch. Warne & Co had one forgetful moment and let a whole lot of other rabbits slip out from under their fence.